The main plot line and the principal focus of the first third of the play is the relationship between Ellie (Katherine Parkinson) and her husband, Richard (Rufus Jones), the head of the society. It is established from the offset that the couple are having problems, and whilst this is slowly and silently destroying Ellie, Richard would rather continue with life, completely avoiding the subject and their lack of connection. Richard's refusal to touch his wife and his declarations of celibacy are consistently underpinned by Ellie's witty sarcasm, and this set-up provokes laugh after laugh and creates the conflict that pushes the narrative forward. The deterioration of Eleanor and Richard's relationship is intertwined with the death of comedian Benny Hill and the party that Richard's beloved Dead Funny Society hold to commemorate his life. Through the Dead Funny Society, we are introduced to three further characters, Brian (Steve Pemberton), their camp friend who assumes a role that you’d expect of an endearing uncle, and Nick (Ralf Little) and Lisa (Emily Berrington), a couple with a newly born baby, who are similarly dealing with their own marital problems. Whilst this set-up has the potential to incorporate three further interesting and complex characters, Johnston's script only gives Ellie and Brian development or depth, and the other three are more simply sketched out as stock characters. The first act is very much a comedy. The array of successful one-liners and very dry humour present an hour or so of dialogue that could happily sit in a British television sitcom. But as the play progresses, Johnston begins to mix in further comic forms such as slapstick moments, which clearly and fondly pastiche some of the classic British styles and comedians that the society so devotedly worship. In fact, as the second act begins and the party scene is in full swing (or perhaps failing to swing), the four society members nostalgically re-enact a number of their heroes' infamous sketches, a device that works surprisingly well. These sketches become moments of light relief as this comedy quickly and quite unexpectedly turns to tragedy. Ellie's sarcastic comments become the cry of a deeply unhappy woman, and more twists and turns in the plot reveal further surprises from all of the characters. The contrast between this seriousness and the slapstick comedy that culminates with an impressive food fight is largely successful, although the second act does begin to drag, and you do find yourself wishing they'd all tell each other what's going on a little sooner. In spite of this rather round-a-bout way of reaching the conclusion, the ending is strong, and one that nicely ties up the loose ends, whilst still remaining faithful to its established comic tones. Huge thanks to Theatre Bloggers and Stagedoor app for making this review possible. 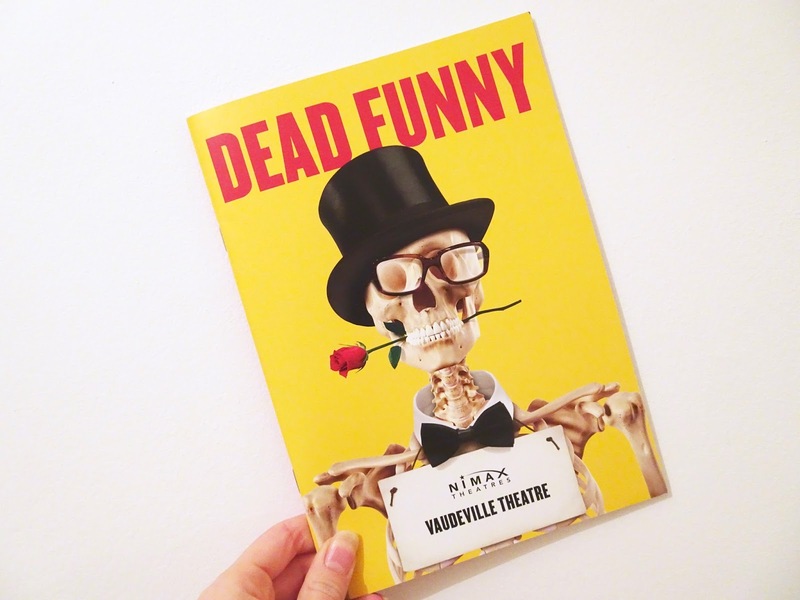 You can catch Dead Funny at the Vaudeville Theatre until 4th February 2017. *I was gifted this ticket in exchange for a review but all words and opinions are my own.